Updated Friday November 25, 2016 by Andrew Brady. 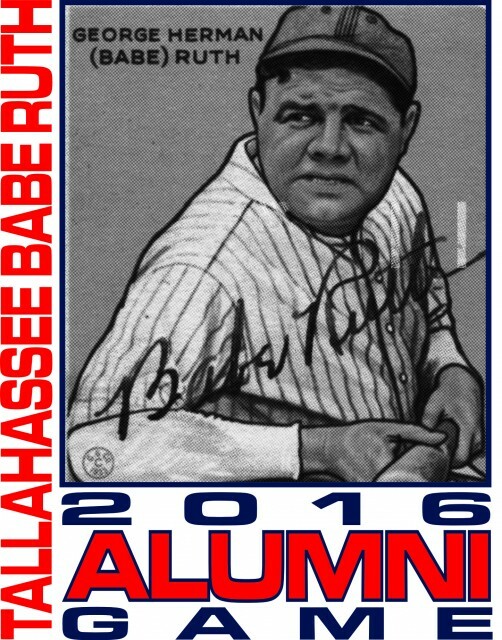 The Tallahassee-Leon Babe Ruth (TLBR) League hosted its first Tallahassee-Leon Babe Ruth Alumni Softball Games Fundraiser and Hall of Fame Induction Ceremony on Friday, Nov. 25, 2016 at Tom Brown Park. The event was held to raise funds to assist local 13-15 year-old Babe Ruth baseball players and recognize the 62-year-old league’s inaugural Hall of Fame inductees in coaches Paul Mauck Sr. and Richard Jackson, coach/board member Cindy Meredith, and players Reggie Jefferson, Dean Palmer, John Wasdin and David Ross. Click for a biography of each of the 2016 inductees. An invitation to play in the alumni game was sent to all former players since its inception in 1954. We had a full 7-inning game between the recent alumni and the old-timers. The old-timers used numerous home runs en route to a 15-10 victory. The highlight for the recent alumni was turning a triple play late in the game to give them a chance for a late comeback. But, their final rally fell short. After the game, a home run derby was held. Each competitor was given 2 minutes to hit as many home runs as they could. The four with the most home runs in the first round advanced to the championship round. Brent Marsh, Brian Basford, Darren Newlin, and Jason Newlin advanced. Jason Newlin won the derby in the championship round. A barbeque lunch was provided by Marsh Pit BBQ. That was followed by the induction ceremony of the inaugural Tallahassee-Leon Babe Ruth Hall-of-Fame class. The ceremony began with the national anthem, sung by Kaylee Owens. Then, our emcee, Jim McNeil, introduced the Hall-of-Fame Committee and Current Board. Our HOF Chairperson, Cindy Meredith, said a few words about the league and its rich history. Then, Jim recognized the vast World Series history of TLBR, its success on a national level, and the alumni by decades in attendance. Jim also took a moment to acknowledge the three all-star teams from last year. Each won their respective state tournament, and the 15u team advanced to the world series where they finished tied for 3rd. Many of the young men from all three teams, along with other current players, were in attendance along with their families. Mitch Englert spoke about the old home of TLBR, Centennial Field, which was located where the current Cascades Park now exists. Then, Jim introduced each of the 2016 Hall-of-Fame inductees and read a biography of their accomplishments. Each inductee, or their representative, was given the opportunity to say a few words. Please visit the Alumni and Hall of Fame section on this website for pictures of the event and full biographies of the inductees. 2016 Hall-of-Fame Class (l-r): Reggie Jefferson, Paul Mauck Sr (represented by Paul Mauck Jr), Richard Jackson (represented by Jeff Hogan), Dean Palmer, John Wasdin (represented by Evelyn Wasdin), Cindy Meredith, and David Ross.